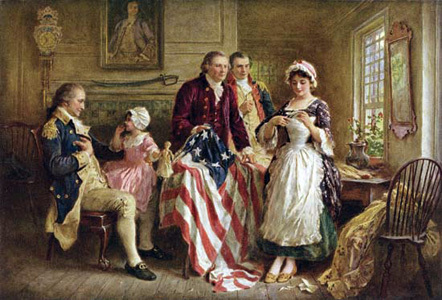 It was a big day for a little nation in May 1776 when Betsy Ross is aid to have been visited by three members of a secret Continental Congress committee, asking her to sew the first flag. Until that time, the various colonies had used many different flags, many of which were quite similar to Britain’s Union Jack. Flags were considered important for troopmorale, and the shaky new nation clearly needed a symbolic source of unity. On June 14, 1777, Congress adopted the flag with then ringing words: "Resolved: that the flag of the United States be 13 stripes, alternate red and white; that the union be 13 stars, white in a blue field, representing a new constellation." Flag Day was celebrated in various places, starting in the 19th century. But, it was not until August 3, 1949, that President Truman signed legislation making June 14, Flag Day, a day of national observance.